The currency of the Earth One line as a whole is thwarted expectations; in Geoff Johns and Gary Frank's first Batman: Earth One, for instance, Harvey Bullock is a handsome television star instead of the slovenly, grizzled detective from the regular books. In Batman: Earth One Vol. 2, Johns elevates this tendency to the theme of the book itself, as what expectations the reader has and the other characters have for one another spiral into the book's mystery and ultimate denouement. In some ways Johns's second Batman: Earth One volume reads too much like a Batman story instead of a young Batman story, and the story's throughway may be too familiar to long-time Batman fans in the vein of Year Two or Mask of the Phantasm. But it's overall a solid book, literate and smart, surprising and scary, and with well-choreographed action by writer and artist. Finishing volume two, it'd be hard to believe this book hasn't won itself a volume three. In the wake of the Gotham finale, in which we saw Edward Nygma's burgeoning psychosis grow stronger, it's not surprising a reader might fall for Geoff Johns's clever trick here -- namely, "When is the Riddler not the Riddler?" Johns does not just thwart the reader's common expectation, that the Riddler plays by a set of rules and might temper or cancel his crimes if the riddle is solved, but the characters' expectations as well. Gotham is so much in a tizzy over their new Batman, fueled further by the rumored croc-man Killer Croc in the sewers, that it's not so far a leap to think a madman might be challenging Gotham to solve his riddles. As such, Johns is able to set the mystery -- the Riddler's motivations -- and its solution -- the five figures vying for power in Gotham -- almost side by side only for audience and characters to look right past it. The Earth One milieu can easily become gimmicky (the first volume's Bullock being a mild case in point), but here Johns subverts that by making it part and parcel of the story's fabric. Johns's best thwarted expectation in the book, however, is when Alfred gets into fisticuffs with Detective James Gordon and the Gotham PD believing they've discovered Bruce Wayne is the Batman, when instead they mistakenly believe him to be the Riddler. Alfred has just finished taking Bruce to task for how many people know that he's Batman -- a fair argument in the regular DC Universe, too -- and when the police storm in, it's a wonderfully nail-biting scene not just for Alfred punching Gordon (a wild, wacky delight that Earth One makes possible), but also for the suspense of whether Alfred will accidentally spoil the secret as he tries to protect it. Like a Greek tragedy, it's a misunderstanding that rises organically out of the story, and Johns and Frank juxtapose wonderfully Alfred's battle at Wayne Manor versus Bruce Wayne's romantic struggles of a different kind across town. Duplicity further abounds, fitting for a book that creates the Earth One Two-Face. Bruce inadvertently reveals himself to be Batman to Mayor Jessica Dent precisely because he perceives Batman differently than the rest of Gotham does (as a symbol of hope, instead of as a madman). The concerned Gothamite who rescues Batman turns out to be none other than serial burglar Selina Kyle (or the Earth One equivalent); this is not Johns's most convincing slight of hand, but it's certainly fun. Predictable also, but still rife with possibilities, was that it would turn out to be Jessica, and not her brother Harvey, who becomes the book's Two-Face. Though written independently, Johns's book and J. Michael Straczynski's Superman: Earth One Vol. 3 echo one another in their Two-Face Jessica Dent and Alexandra Luthor respectively. Each teased as part of their story the historic male version of the hero's foe; each ended with the female counterpart taking the role. Gender is certainly a difference that Earth One can play with, though something like Alfred as grizzled war hero, Bullock as TV star, or the Riddler as not-the-Riddler feel better-conceived to me than the difference being only "established character, just as a woman." We need more well-developed female villains, sure, but "female Lex Luthor" and "female Two-Face" seem like easy changes, not thematically-tied alterations. In this case, I think Johns does a little better in that Two-Face Jessica Dent brings with her a romantic tie to Batman and the knowledge of his secret identity; Alexandra Luthor is for my tastes too much the classic mad scientist Lex by a different name. Again, Johns and Gary Frank choreograph some excellent scenes, not just the fights but, for instance, the creepy moments where Batman perceives Killer Croc watching him, just before Jones strikes. Frank's art is largely strong here; whereas some of Frank's characters in Batman: Earth One Vol. 1 still bore a resemblance to those in Frank's then-current Superman work, that's gone away now. Everything looks good, though Frank is better in the very distinct characters, like crew-cut Alfred and mustachioed Jim Gordon, than in the "standard" men like Bruce Wayne, Harvey Dent, and Harvey Bullock. The credits suggest only one artist and inker, though I wonder -- roundabouts the train scene, given Batman's clenched jaw and ever-present teeth -- whether there wasn't a second artist involved. Geoff Johns echoes the first volume at the start of Batman: Earth One Vol. 2; in the first book, Batman famously jumped from one rooftop to another, missed, and fell in a dumpster, but here, he makes it. I actually felt Johns took a step too far in this, presenting this Batman as someone who knows what he's doing too early, when the joy of Earth One is in the characters still figuring things out. This is tempered by the end in that this Batman has neither cave nor car nor signal (of sorts), and ultimately -- perhaps too understated -- what Batman really learns in this book is the importance of being Bruce Wayne, but I do think at times Johns nears telling a Batman story instead of an Earth One Batman story. 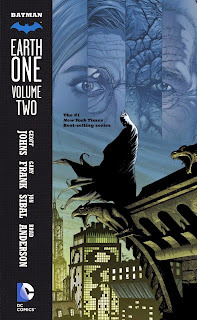 Irrespective, Batman: Earth One Vol. 2 is a detailed, complicated read, and again the word that comes back to me is "solid" -- whereas the Superman: Earth One books sometimes feel like done-in-one movies, when you finish Batman: Earth One Vol. 2, you feel like you've just finished reading a novel. The bar is set again for Earth One books and I'm eager to see what Johns does next time. Another excellent volume I just couldn't put down. Johns had a lot more balls to juggle this time, but somehow he kept it all cohesive and still found the time to sneak Catwoman up on us. I just hope we won't wait another three years for the next one, as much as I'd love to get a Shazam ongoing by this creative team.